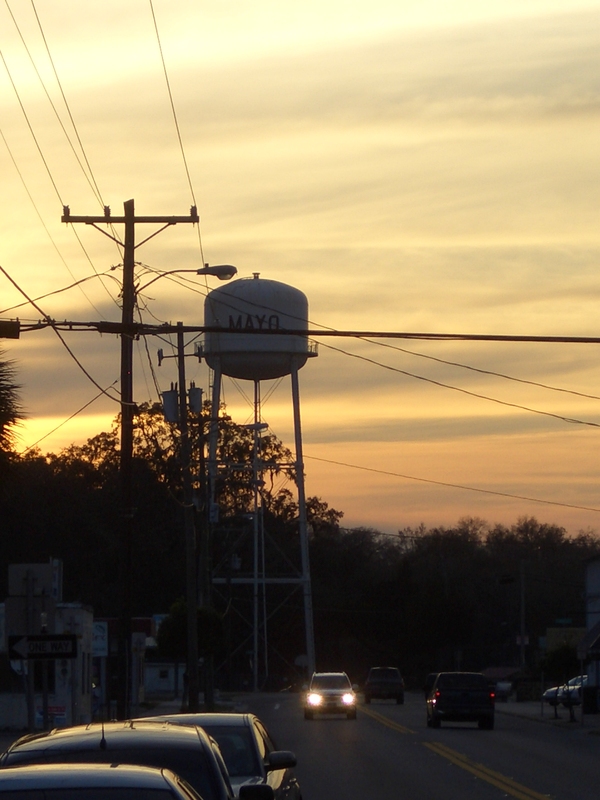 The Mayo Water Tower at sunset, March 2010. 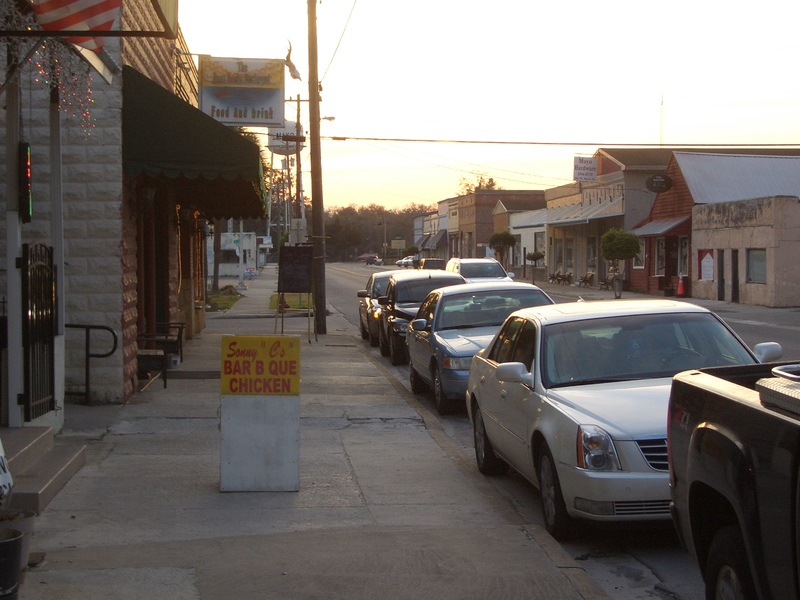 Sometime in March of 2010, I was involved with a wildlife filming expedition (of sorts) to Northwestern Florida when my group wound up riding through a small town called Mayo. Initially, we found the town’s name quirky enough and its water tower iconic-seeming-enough to earn a drive through the small central district. I wasn’t able to spend as much time getting to know Mayo as I would have liked. A lot of our filming happened elsewhere in the thinly-populated Lafayette County, which I somewhat ignorantly referred to as “the abyss between Tallahassee and Gainesville” to northern friends. Pragmatically, though, there is something almost ghostly about that area. Mayo’s population has hovered precariously around 1,000 for most of the 21st century, yet it’s still the county’s administrative seat. Our business there was filming some county council meetings, speaking with some regional citizens who had lost property during widespread wildfires that had ravaged Northern Florida earlier in the decade. 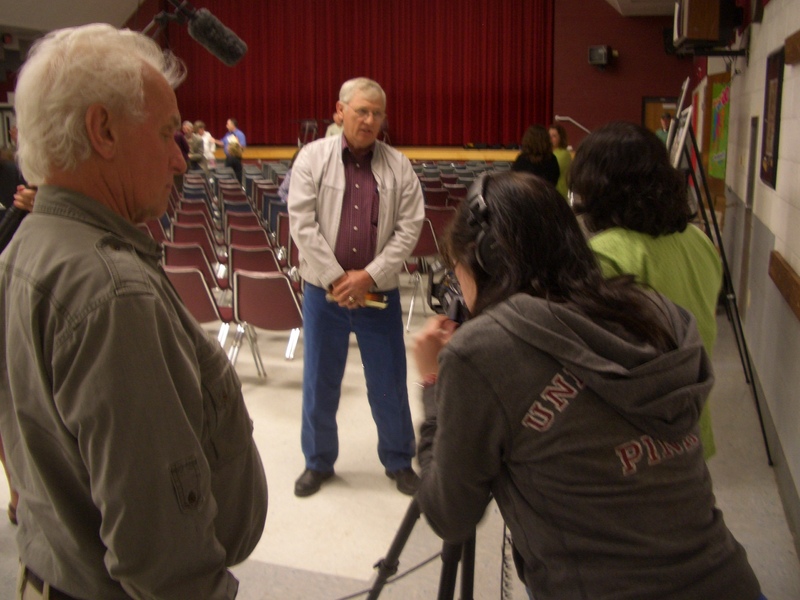 Students from American University interview a Lafayette County resident about his experiences with wildfire on his property while filmmaker Wolfgang Obst looks on. Before too long, I got bored with the proceedings and decided to wander outside to stretch my legs. It wasn’t my project; I was only there because I wanted to catch another glimpse of this quiet little town before wrapping our filming week and heading back to DC. My restlessness led me to a softball tournament happening in the fields outside of the high school, which quickly became a highlight of the entire trip. I have no idea when I would have time to write a paper about it, but there has to be some ground to the types of activities that provide the most “authentic” (dirty word, I know) experience of a place. I would place “softball tournament” right up there with “local dive bar performance” as the best barometer of what constitutes the quotidian in any locality. People are there in equal parts because they want to be and because they have some type of civic or familial duty to be. 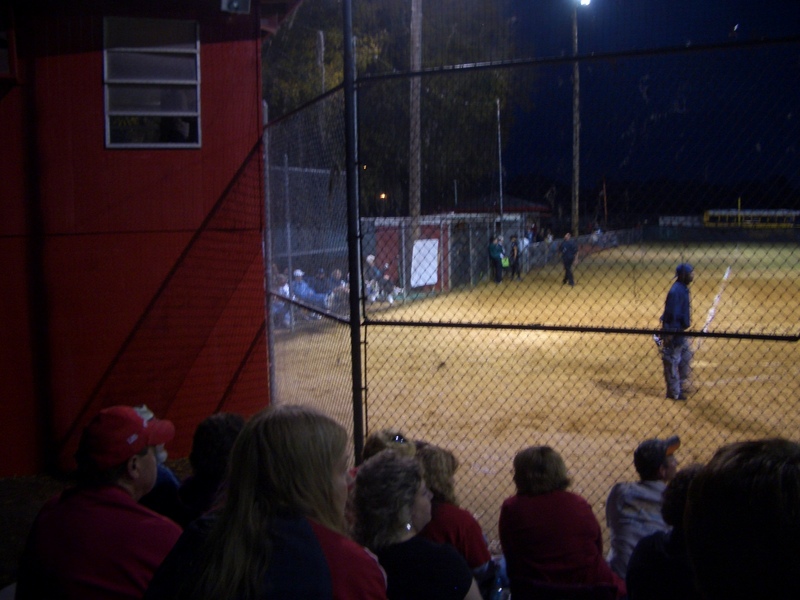 The timbre of the crowd watching softball (including myself, I gladly paid the $4 entry fee) seemed to lean toward the former. The early-evening temperature was perfect and the Florida Panhandle accents abounded (keep in mind this was still a novelty to me at the time; I wouldn’t move to Tennessee for another three years yet). Needless to say, that tiny town in what felt like the middle of nowhere off the Suwanee River left a disproportionate impression on me. I left a couple days later to go see a music festival in St. Augustine, and I couldn’t get Mayo out of my head for some reason. I had a standing offer to return to Lafayette County that weekend for what our group’s regional liaison Sharon referred to as “the biggest redneck barbecue of the entire year,” but I couldn’t manage it. In fact, a few days later I flew back up to DC and resumed my life, wondering if I would ever have the chance to pass through Mayo again. A few weeks ago, against some range of odds, it happened. My friend Sean and I were on a road trip between Tallahassee and Gainesville, and decided to take the rural route 27 rather than the markedly less scenic and only marginally faster freeway-to-freeway route. The only real advantage to doing that would have been a photo-op with that iconic Cafe Risque “We Bare All” billboard. We made the right choice in taking 27. 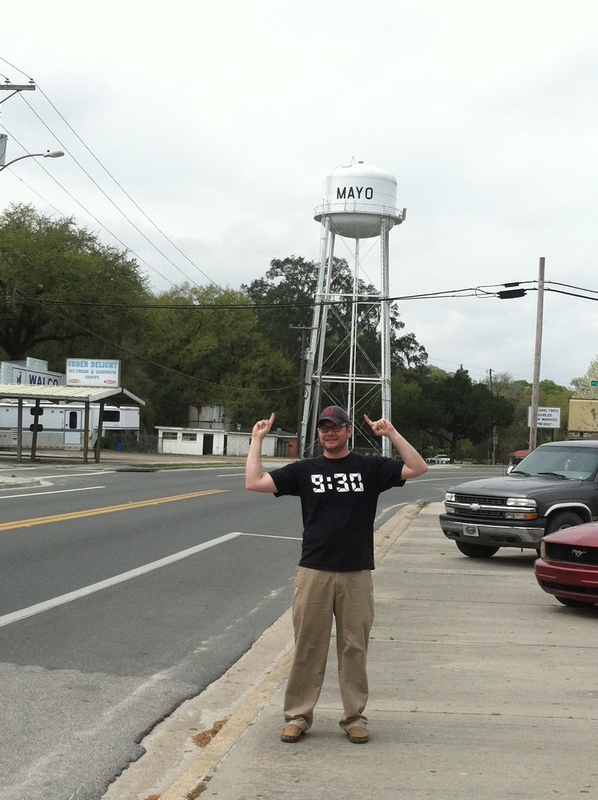 One thing I had forgotten was that Mayo is almost exactly in between the two cities. There did not seem to be a clear majority of Seminoles or Gators gear on license plate frames or poorly-fitting t-shirts. The equilibrium felt (here’s that word again) ghost-like. In fact, the town felt largely the same, though it was a welcome relief seeing it in full daylight. March 19, 2015. Pardon my misplaced enthusiasm. 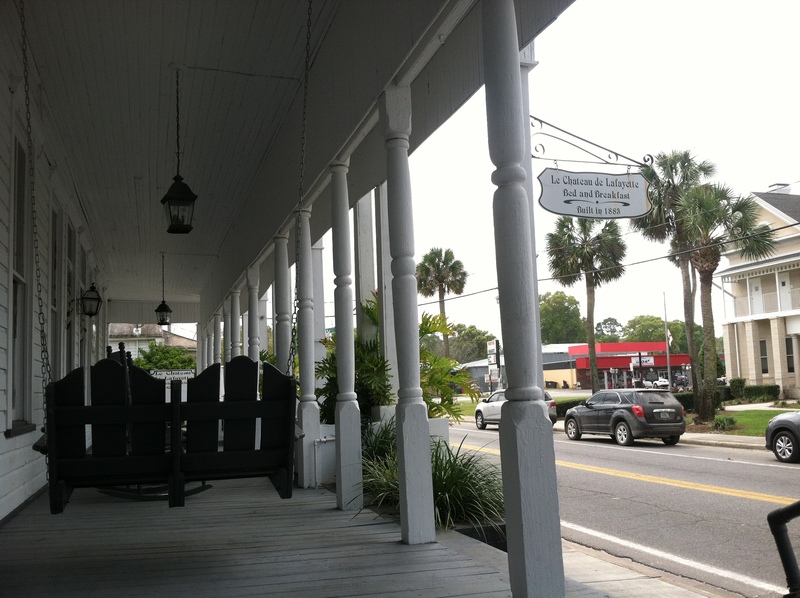 My friend and I stopped at Meme’s cafe (pronounced Mimi’s) right in the center of town for some lunch and to recharge. Meme’s is located in the space where Sonny C’s Barbecue Chicken stood five years ago (you can see the sign in the photo of Main Street above). We were distracted with a sign that read “ya’ll come back” to exiting customers; were the proprietors of this diner trying extra hard to seem Southern? It wouldn’t shock me to find out that Mayo has pockets of retirees or non-Natives who wanted a quieter, less expensive life than places like New York, Miami, or Atlanta could have offered. We also wandered into the one prominent supermarket in town (actually directly to the right of where I’m standing in that picture above) and discovered how heavily Latin-American the market was. 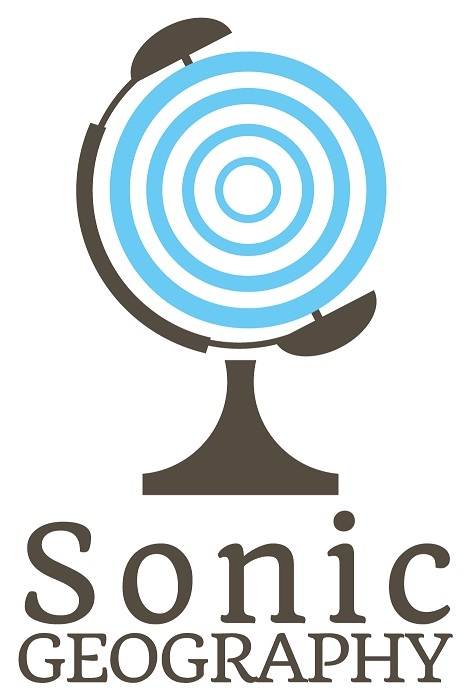 It came as a surprise, considering how off-the-beaten-path the town seemed, despite exploding Mexican and other Central-American populations throughout the “New South.” Only approximately 16% of census respondents categorized themselves as Latino of any race as of 2000, though one could assume that’s risen substantially since then. The porch of the Old Lafayette County Courthouse (1888), now a Bed and Breakfast. 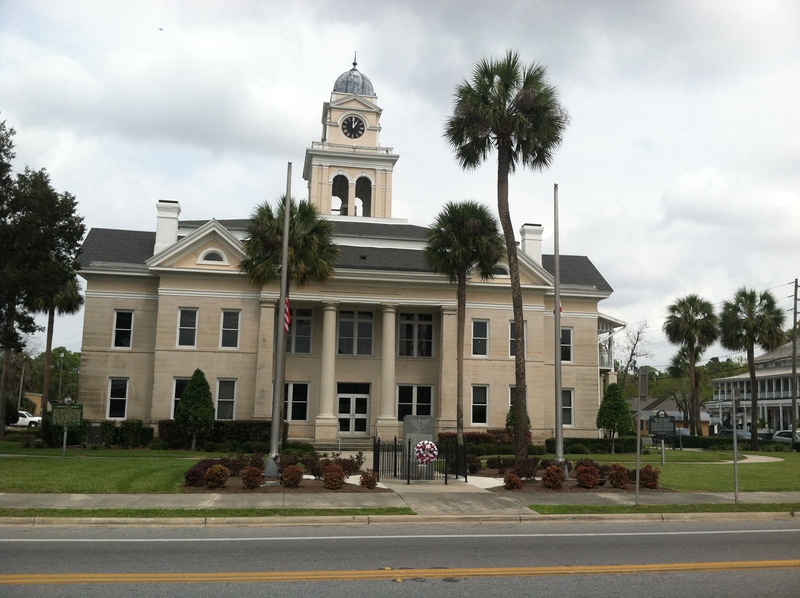 The current Lafayette County Courthouse (built in 1908) can be seen off on the right side of the frame. March 19, 2015. Nothing against Meme, but I wandered into the restaurant on the left out of curiosity before we left for Gainesville. The scent of roasting BBQ smacked me in the nose and I think I may actually have said “wow” right within earshot of the proprietor. 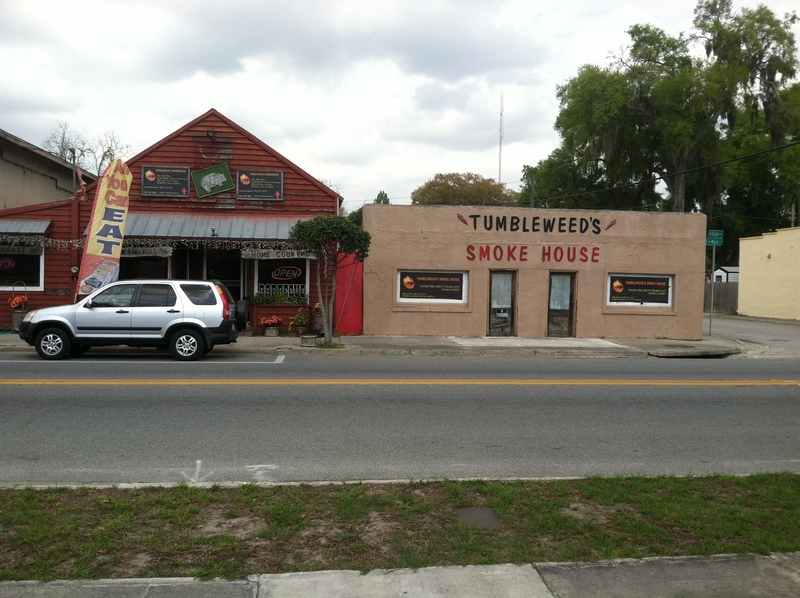 It made sense, considering how the actual smokehouse sat right next door to the dining room; most of the time you see smokers sitting fairly far afield from where the customers actually eat it. Not a bad approach for the latest agents in the always-changing BBQ situation in Mayo. I wish we had chosen to eat there. There’s always a next time, though. I know some of you may be getting sick of how much love I give Florida on this site, but it’s hard for me to resist. I know it’s inaccurate because I’ve spent a disproportionate amount of time there, but I feel like I’ve found more cool small towns in the Sunshine State than the other 49 combined. The lesson here is, no matter how you may feel about a state, you will very rarely regret taking that rural route if you have the time.